It’s been 5 years since I joined the Twitter revolution in May 2009. It wasn’t long until I organically built my first Twitter network to over 2,000 people and started on my second. Shortly after I joined, I made what I thought was a very obvious observation. As it turns out, social media professionals that manage accounts for very large corporations are still making the same mistake 5 years later. I got into online arguments with so-called superusers with 10’s of thousands of followers, and they were absolutely certain they knew what they were doing. So what is this mistake that makes me cringe every time I see it? Whether you’re an everyday user, superuser, or social media professional, you need to know the difference between a public mention and a direct reply. NOT a Direct Message (or generically, ‘private message’), but a direct reply. Let’s say Margo tweets: Hey, everyone, what should I eat for lunch? @Margo Have you tried rocky mountain oysters?? You should get them with buffalo sauce! I think we all get that. RT @Margo: Hey, everyone, what should I eat for lunch? or you can just hit the ‘retweet’ button on your chosen Twitter interface. Either way accomplishes the same thing — Margo’s tweet has been broadcast all of your followers. Another way of gathering opinions for Margo is by getting creative. Hey, everyone, @Margo is wondering what she should have for lunch. Any ideas for her? Once again, all of your followers will see that Margo is asking for lunch suggestions. The incorrect way to mention someone when trying to broadcast to ALL your followers is by starting the tweet with Margo’s name. WRONG WAY GOUGE MY EYES OUT: @Margo wants lunch suggestions. What should she have? This is wrong because there are no characters in front of the ‘@‘ symbol. In this scenario, only your mutual followers will see the tweet. That is, only the people that follow both you AND Margo will see the tweet. If your follower is not also following Margo, it will never show up on their timeline. On all the examples for Correct mentions and retweets, there is at least one character in front of the ‘@‘ symbol. It can be the quotation mark, a period, a hyphen, and emoji….anything. Your tweet just cannot start with @. Once you start a tweet with ‘@‘, only mutual followers will see that tweet. 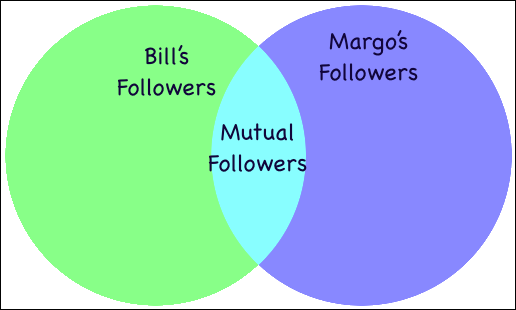 A mutual follower is a follower that follows both you and Margo. A venn diagram explains this masterfully. So to beat a dead horse, if your tweet starts with ‘@‘, only the people in that intersecting area of the diagram will see your tweet. If you truly want ALL of your followers to see a tweet, it must start with some character other than ‘@‘. This goes for creative retweets or if you want to call someone out (for good reasons….or not). Social media and Twitter is ever-changing so I’m not saying it will be this way forever. However, it’s been this way for over 5 years and people are still making the mistake. Don’t be them. Be better. For more social media tips sign-up for my free e-book, Don’t be a Social Dumbhead, below. Seriously, I didn’t even know that. Thanks, buddy.